An NGO called Goa Parivartan Manch has petitioned President Pranab Mukherjee, requesting him to ask concerned authorities to investigate the MNREGA scam in Goa. PANAJI: The names of Goa chief minister Manohar Parrikar, Bollywood legend Amitabh Bachchan, Indian cricketing wizard Sachin Tendulkar and other film stars and international cricketers figure in the list of Mahatma Gandhi National Rural Employment Guarantee scheme in the Goan village of Chimbel, barely five kilometers from Panaji.The startling information was brought to light by Goa Parivartan Manch adviser advocate Yatish Naik at a news conference in Panaji on Saturday. Not only is the Goa chief minister’s name registered as the card holder in Chimbel under the MNREGA scheme, which guarantees 100 days of unskilled work at the rate of about Rs 150 per day, Amitabh Bachchan’s entire family — from son Abhishek Bachchan, daughter-in-law and former Miss World Aishwarya Rai Bachchan, wife Jaya Bachchan and even now-expired mother Teji Bachchan figure on the list. Naik has written to the President of India Pranab Mukherjee demanding a thorough inquiry into what he described as a “multi-crore scam.” Naik and other members of the Goa Parivartan Manch also met Goa governor Bharat Vir Wanchoo seeking his intervention for an investigation into the scam. 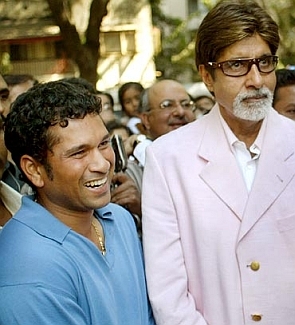 Other celebrities that are listed as beneficiaries include Riky Ponting (misspelt name of Australian cricketer) and his apparent family with names like Micky Ponting, Rosy Ponting, a series of names of the Tendulkar family starting with Sachin, Anjali, Sara and Arjun. Naik said he will now obtain details of how much money was paid to these people and which government authorities colluded to register these names as beneficiaries.